Perfect fall practice conditions led to what many believe is the new unofficial 5-bass tournament record weight for Lake St. Clair. During a local event on October 9, 2010 known as Monsterquest, bass pro Scott Dobson and tournament partner Kyle Green dropped 5 big Lake St. Clair smallmouth bass onto the scales for an amazing 29.68 pounds! 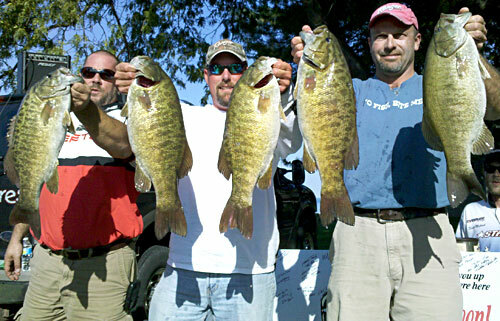 Their 5 bass included the big bass winner of the day â€“ a huge 6.78 pound toad smallie! Once again, fine work Dan. From my perspective it was spot on but I couldn't hear what Dobber said as they were leaving. Now I know! And I know the secret bait too but I won't tell! Thanks for all you do Dan, you are really the bassfishermans best friend in Michigan. Hope to see you next Spring for MonsterQuest 2011! Holy cow, that is out of this world! Congrats to Scott and Kyle, that will certainly be tough to beat. Thanks for the article, Dan. It was a great read. Excellent job Dan. Great read !!! Glad you liked it and thanks so much for the feedback! 2013 Monsterquest 8 from 9 mile ramp is $10k for first! Only if I had lots of coffee and someone told me I was a shoo in!!! I hate being a donator. Don't have some necessary things to be otherwise. I like fun-fishing a lot. Less stress. Less expensive. Still very fun. You youngsters can battle over the big money. I will just read about it.